At approximately 8:30 am, Dec 12, 2015, I was outside my home, waiting for a co-worker to pick me up for work. It was a very mild & breezy morning & the sky was mostly clear except for some clouds here and there. As I’m usually want to do when outside, I enjoy the nice sky. This morning I noticed an airliner very high up, at a guess anywhere between 10-20,000 feet traveling in a roughly east-westerly direction. As I watched it, a glint of light far behind it caught my eye. I suddenly saw 5 gleaming spherical objects trailing the airliner going the same direction at approximately 1-1+1/2 miles. 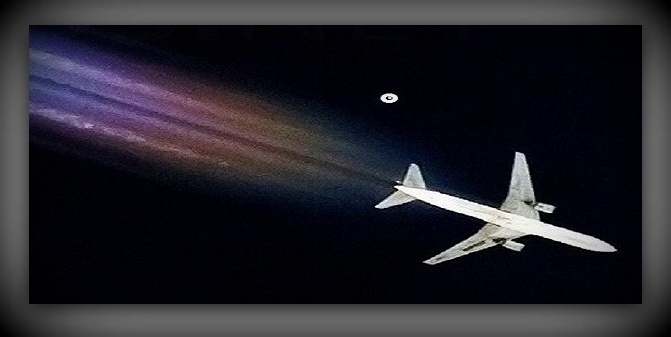 The objects were keeping pace with the airliner & were in a “diamond” type formation with the closest object behind the airliner being the “bottom tip” of the diamond & the other four, one each, at the “points” of the diamond. All objects traveled in the exact same direction & were equidistantly spread apart one from another, perhaps hundreds of feet. At no time during the brief sighting did they speed up, slow down, change direction, move away from their positions or “phase” out of view. 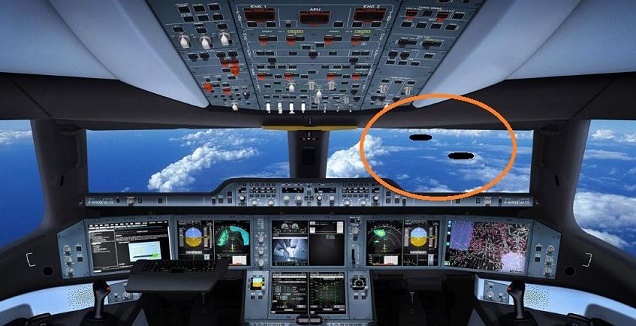 I immediately ruled out the possibility of high flying birds as all the objects were visibly flying, at some points, ABOVE the highest cloud layer, which the airliner was also doing. If they were birds at that height (which as a far as I know, birds don’t fly that high) they would’ve been far too small to see with the naked eye & certainly would not reflect a metallic gleam as these objects did. Also, being that far above a cloud layer that high, as I saw their shape, they would’ve been FAR too large to be birds. If I had to guess at their size at that distance in order to be seen from the ground the way I did, they would’ve had to have been at least a hundred feet in diameter apiece. As mentioned, the sighting was very brief, merely a minute and a half or so. I was anxiously awaiting my co-workers arrival to help me verify my sighting but sadly, he arrived literally a few seconds after they & the airliner they were tailing, all disappeared into the distance. If anyone has seen these objects at nearly the same time I did, I would very much like the corroboration. I’ve only ever seen a few “unexplainable” airborne objects in my lifetime but this was by far the most exciting! Workers of a company in Lota claim having seen an extraterrestrial craft flying over the commune. These employees believe it stopped in mid-air to observe them. More than stars can be seen in the skies over Lota. Mario knows this well; he is an employee with a company located only meters from the coast, and on December 8 (2007) he had an experience that has left him in shock to this very day. “I am certain that the crew, if it had one, were aware of my presence and that I was watching them,” he recalls. It was after 10:00 pm when the worker went to greet the new shift. Around 2:10 a.m., he headed to the northern section of the facilities, and at a distance of 100 meters from the “pandereta” (brick wall) that borders the company’s perimeter, he took a casual look at the sky and saw a “machine” fly overhead. “There was a fluorescent light around it. No portholes were visible as one would see on an airplane. The object was dark, flat on its underside. It had an oval-shaped tail section with two lights on it. The one on the right was orange-red, and the one on the left violet. Both were intermittent, but not in sequence,” he recalls. Frightened, he radioed a co-worker, who told him: “No, it’s just a plane. I signaled it with a flashlight, and it’s a plane.” Bu Mario did not believe this. “I have seen commercial aircraft flying over the city and in spite of their altitude; one always hears the sound of their jet engines. This was not a craft made on Earth.” In spite of the shocking experience, Mario believes himself to be among the “chosen.” “I saw that the machine was over Cerro Fundición in Lota Alto. From my perspective, it could be seen over Blocks 6 and 7 (apartment buildings). Then it made like a 90 degree turn, which puzzled me even more, because I’d never seen something in the air with these characteristics. The flying machine appeared to be patrolling the area,” he stated. According to the witness, the object continued on its way, flying over a considerable section of Lota and then heading for the woods on the Cordilleran forest belt. The sighting lasted between 10 and 15 minutes. His friends also saw the object. What did they say about it? “They laughed at first, but then they all corroborated that what they saw wasn’t anything man-made. 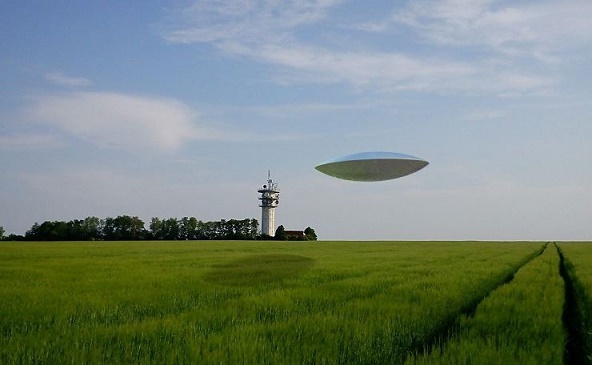 It was odd, but a co-worker said, very seriously: “I think they were among us.” NOTE: The above image is a rendering. I suppose this incident finally, after all these years, led me to create Educating Humanity. I feel that people are now compelled to tell their story for a reason. I think you will find more and more of us coming forward. I have told my story to family and friends on numerous occasions, and finally, I posted my sighting on a forum. I have been reluctant to go public with it for various reasons, but it seems that enough people are finally waking up, that it is no longer that incredible. I came home late from work, about 8:30 pm, sitting on the back deck behind the house facing the golf course. As soon as it went out of sight I ran from the deck through the dining room, kitchen and out on the deck facing the street. I jumped over the railing and headed towards the golf course. As soon as I turned the corner, I started to think that this may not be a good idea. I returned into the house and grabbed paper and pencil and sketched out the craft at the dining room table, I wrote down the exact time, lack of sound and described the craft exactly as it appeared. The one thing that struck me very clearly was that whatever I had just seen was not of this world. Nothing that large could move with absolute silence, there was nothing that large that could gain flight in our world. I had a hard time getting to sleep that night and finally fell off sometime after midnight! The next morning I woke up with absolutely no memory of having seen a UFO. Sometime in the early afternoon I was going out onto the deck facing the golf course and saw my yellow legal pad with the sketch and description of the craft. The second I saw the it my memory immediately returned to the event I witnessed the night before! 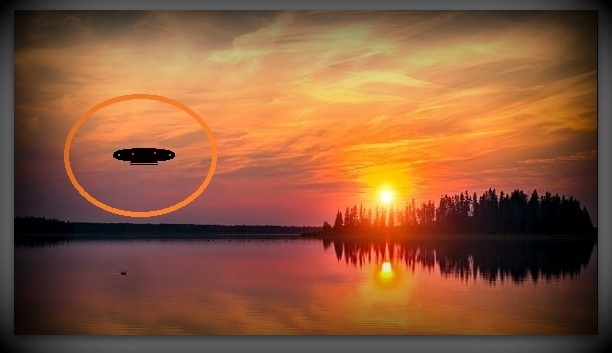 To this day, there is no doubt in my mind that I saw a UFO. There is no chance that it was a weather balloon or some other questionable object. This was some type of craft flown by intelligent beings that had technology that far outstripped anything that man has created. The memory to this day is so strong and the vision so vivid it is like it happened yesterday! NOTE: The above image is the witness rendering. Description: I just read the sighting made by the pastor in Alto New Mexico. I could not believe it at first since I saw the UFO’s the same night. I saw 3 orange orbs North of my home in Ruidoso, NM. We are south of Alto about 5 miles. I heard what I thought was thunder around 10:45 PM, but I knew there was not any rain in the forecast. I walked outside on my deck and looked towards the North. I saw the 3 orange orbs. One was West with the other two East. First I wondered if the military were conducting some sort of exercises in the area. I thought maybe they were flares. In a few minutes the West orb started to move up. The other two remained still in the sky. Then I knew they were not flares. Flares drop and do not move up in altitude. Then two white orbs appeared between the orbs and started to rotate in a perfect circle. I ran inside to get my wife. By the time I returned they were gone. About 4 to 5 minutes later 2 fighter jets roared overhead of my house. They were moving fast with their afterburners on. They were fly from the SouthWest which is the direction of Holloman Air Force Base which is out of Alamogordo, New Mexico. About 10 minutes later they returned heading back to the Southwest. The orbs were not of this world. Second Report From Witness: Hi: Yes, the date of my sighting was on the 10th of June. I like to read the articles from the Black Vault when I get the chance. I was so surprised when I read the Alto sighting. I ran into the bedroom to tell my wife. No other sightings since then, but my wife had an interesting sighting in the summer of 2014. It happened around dusk. We both were sitting on our deck late in the afternoon when in the Southwest right over the mountain range we saw three lights in a horizontal row appear. They looked like a traffic signal. They stayed lit for a couple of seconds and then in a split second moved to the right. The distance I guess would have been a half mile. Then again in a split second they went out and moved again to the right. The lights were quite large at that distance of roughly 10 to 12 miles as the crow would fly from our deck. The lights were Orange, Red, and White. We saw these lights appear 3 times. Note: The witness has provided corroboration for June 10, 2015 sighting in Alto, NM. 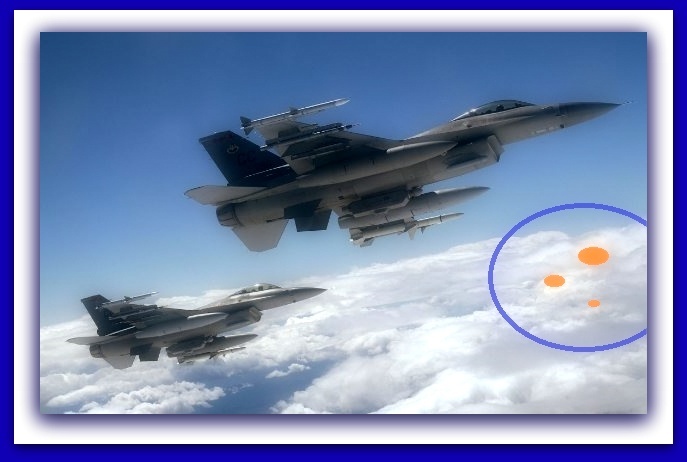 The radar data and aviation records from Holloman AFB confirm that jets were in the air outside of a military operations area. The radar data also show several unusual returns concentration right to the north of Alto, NM. NOTE: The above image is a rendering. 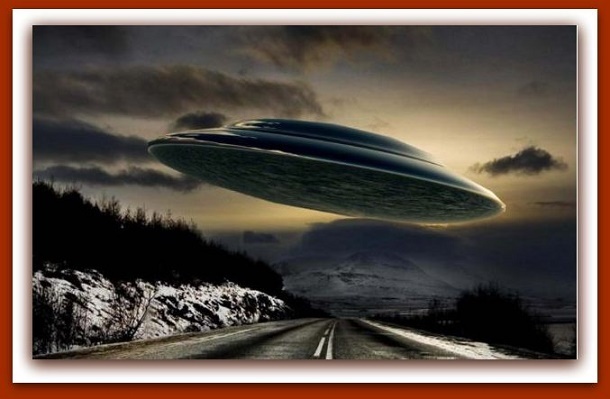 A woman named Theresa called in to share how, back in the 1950s, she and some friends returning from a day of shopping, encountered a UFO and its occupants on the road in Pennsylvania. “Hello, my name is Theresa Frywinder. I just sent you a message via the wormhole (Art Bell’s e-mail), explaining, trying to tell you about an episode that happened in the late ’50s. There was three of us, Mary Jane Robinson, her mother Dorothy Robinson and myself. We were in rural Pennsylvania, Shippensburg. We went shopping in a mall. Mary was getting ready to go to nursing school. She was getting ready, buying a few things and, uh, the stores closed at 10. We were coming back from Shippensburg and Mary hated driving on the Interstate 81 so we always took the rural back roads and it was a perfectly clear night, a million stars visible and some moon light. And it was just, you know, a lovely drive. And, out of nowhere, there were these lights that came up behind us and Mary thought that somebody wanted to pass so she put her arm out and she said, ‘Pass! Pass!’ and she slowed down and they didn’t pass. But they were close and it was annoying her, so she stopped the car and she said, ‘I want to find out what is going on.’ And her mother said, ‘Mary, don’t get out of this car. Just stop. Let them go. Ignore them.’ And she said, ‘No, maybe something’s wrong.’ Ever the care-giver, nurse Mary… And I was in the back-seat. I got out of the car as well and I’m like, uh… I guess. Mary was 18 and I was (counting under her breath), I was 14. And so I got out of the car also and I was on the passenger side of the car. Mary was on the driver’s side of the car. And she walked to the rear of the car and I was already pretty much there. And there was this object. There was no lights this time. When we stopped and got out of the car, the lights were gone. And you couldn’t even see where there had been headlights or anything, it was perfectly smooth. And I’ll tell you what triggered this was, the other night you had the guy on that said that the object was black was shaped like a, um, what did he describe it as a, um… shoot… um, at any rate it wasn’t square, it wasn’t like oblong or like a hot dog or anything like that. It sort of had a rise in the center from the top as though it rose and the bottom appeared to be flat and the sides were curved but very smooth. There was not a sound at all, Mr. Bell. Not an engine, not a hum, not a nothing… It was absolutely quiet. (Art asks if she was frightened). No, because we didn’t feel threatened. I mean, I actually touched it. I was so fascinated with it because I didn’t know what it was made of. In later years I came to realize that it was like titanium. It was perfectly black and the moonlight made it look shiny. (Art starts rushing her, as always, asking if they took off or whatever) No, we did not take off. Mary starts asking, ‘Hello, do you want to talk to us, I’m not afraid.’ and I said, ‘I’m not afraid either.’ I said, ‘Would you like to speak to us, would you like to ask us questions? We’d like to ask you questions. Don’t be afraid, we’re not afraid.’ We were kids, you know. Now Mary’s mother is in the front seat crying hysterically, ‘Get in the car! Get in the car! I don’t like this, I’m frightened!’ And Mary’s just, ‘Ma, shut up!’ (Art starts telling her he has to go go go, rush rush rush) This is the thing that was amazing, it just lifted straight up without making a sound, it just elevated as if to go up and while it was right in front of it… I mean I wasn’t a foot from it and I could put my arm out and touch it and it just lifted straight up and just sort of took off. And as it took off, lights around it started circling, different colours and we could see people inside and we waved… we waved goodbye. (Art asks, human or non-human) They were too far away but they appeared to be human, they had heads, necks, shoulders, arms and, the one thing that Mary said was, ‘They don’t have five fingers.’ and, see, I wasn’t looking at the fingers. And, um, we were waving to them saying goodbye and they waved back to us.” NOTE: The above image is a rendering. PLEASE HAVE A WONDERFUL CHRISTMAS AND A VERY HAPPY NEW YEAR………. The flight began on November 16, 1986, with himself and a crew of two (copilot, flight engineer) in the cockpit. The plane landed in Iceland and waited for good weather. The next day the plane took off heading north northwest. A bright moon helped with the visibility for the night flight over Greenland, but as the plane continued over northern Canada the moon set behind them. When the plane reached an air route reporting point in far northwestern Canada called “Shingle Point” the sky ahead was dark except for an afterglow of sun in the west. The plane reported its position to the flight control center at Edmonton, Alberta, and continued across the Canada-Alaska border, where it made history. UFO history, that is. Although this wasn’t a routine flight, it wasn’t supposed to be a newsworthy event. But something happened over Alaska which caught the attention of the world for several days in late December and early January, 1987. Virtually every newspaper in the world carried a story about what Capt. Terauchi and his crew saw over Alaska. This is the story of that sighting as told to the Federal Aviation Administration (FAA) by the crew members and the flight controllers on the ground. A Japan Air Lines 747 cargo jet, piloted by Captain Kenju Terauchi, was flying westward near Mt. McKinley when he spotted a UFO. “Then there was a kind of reverse thrust, and the lights became dazzlingly bright. Our cockpit lit up. The thing was flying as if there was no such thing as gravity. It sped up, then stopped, then flew at our speed, in our direction, so that to us it looked like it was standing still. The next instant it changed course. There’s no way a jumbo could fly like that. If we tried, it’d break apart in mid-air. In other words, the flying object had overcome gravity,” Terauchi said. Terauchi and his crew had the sighting but John Callahan, the FAA Division Chief of the Accidents and Investigations branch, had the data. The radar report covered more than a half hour. Callahan states in the following video interview, “As far as I’m concerned, I saw a UFO chase a Japanese 747 across the sky for over half an hour on radar.”He goes on to say that members of President Reagan’s Scientific Study Team, the FBI and the CIA he met with about the incident expressed excitement at the data. NOTE: The above image is a rendering. ALIEN DISC WITNESSED NEAR LAKEWOOD NAVAL BASE IN N.J. I was about 12 or 13 years old. It was daytime and I was doing someones hair in the living room near the front door of the house. I heard a loud humming and fluctuating sound coming from outside. I went out to see what it was. I stood out in the middle of my front yard looking up. Trees obstructed my view until the craft slowly moved into view right above the tree top. It then stopped over me. I felt paralyzed, maybe because I was shocked. I know I was thinking, pay attention to everything you see so you don’t miss any detail and can remember what you are seeing. The craft was shaped like a disc, but it tapered in the back to a point. It was a little more round at the top and flatter(but not flat) underneath, like a disc. It had 3 elongated lights around the front, but were spaced . I saw none in the back. It was about 30-40 feet in diameter. After a few moments, it moved slowly over me and that is when I saw the back of it. I was very scared, thinking- what is going to happen to me. I felt like those inside knew I was there and they were observing me. I also felt like they had almost called me outside only. The reason I say this is because I can’t understand why no one else in the house came out. It was so loud! Why didn’t the others follow me out to see what the noise was? After the craft had moved very slowly over me a very short distance, it took off extremely fast and slightly to the right of the path it appeared to be on when it came. I became completely hysterical, screaming as I ran into the house. I yelled at my mom and dad screaming we have to call the police the government, somebody, everybody, anybody. Nobody believed me, they did their best to calm me down and told me it must have been a plane. They were wrong! It was no plane. It wasn’t shaped like a plane. It didn’t sound like a plane and it didn’t move like a plane in maneuvering or speed. My dad went out to look around and said he saw a transport plane out there in the distance. What I saw was long gone even before I began to run to the house. I never knew who I could share this with all these years. Family or friends never believed my story, but I never forgot it to this day. I have no pictures of course- it came and went unexpectedly. I can draw a picture of it, but don’t know how to summit that. 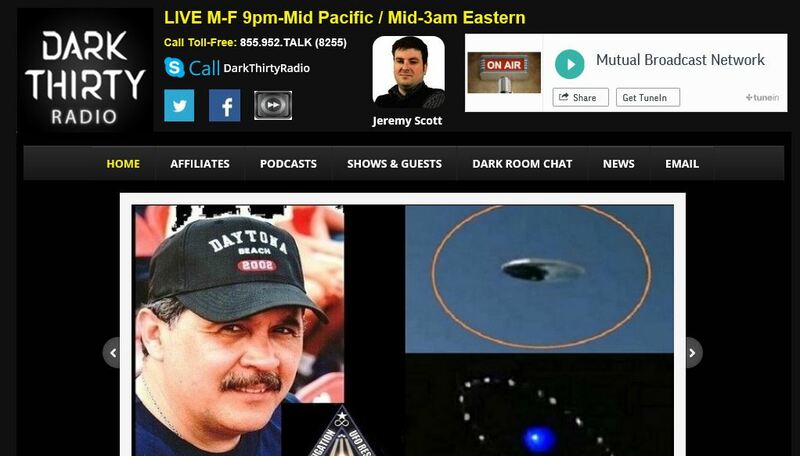 I would never believe in UFO’s had I not seen one for myself. I have never had any other experience since then. I don’t remember my street address where this encounter took place, but could look it up from school records if I had to I’m sure, I just don’t know how to do it. NOTE: The above image is a rendering. I want to start by saying this was a up close and personal account. It was harvest time in central Illinois, in the afternoon I had dropped off my semi in a soybean field for the farmer to fill up. About 10 pm my brother went with me in the pickup to go get the semi. It was a nice clear dark night, probably 70 degrees and no wind. The field was near the end of a one lane road only 5 miles off the highway. Several houses are scattered around the area. The terrain is nearly flat with many trees and wooded areas around. This field was in a clearing of trees about 150 acres. As I turned left off the road into field my semi was 100 feet ahead. Just as the pickup turned into the gate we see giant lights straight ahead thru our windshield. I froze and stopped the truck. There were 10 or 12 of them, in a straight line shining bright white light. It was double length of my semi, which is 70 feet, and was lighting up the semi and ground surrounding it. It was very close, about treetop high and there is no other equipment left and no crops standing. Were out in a flat empty field. Whatever or whoever behind the lights was apparently checking out the semi truck and within a minute or 2 of us pulling up the lights went out in pairs, starting at each end about 1 second apart until it was dark. Just like each pair was on a separate switch and you flip them one at a time. 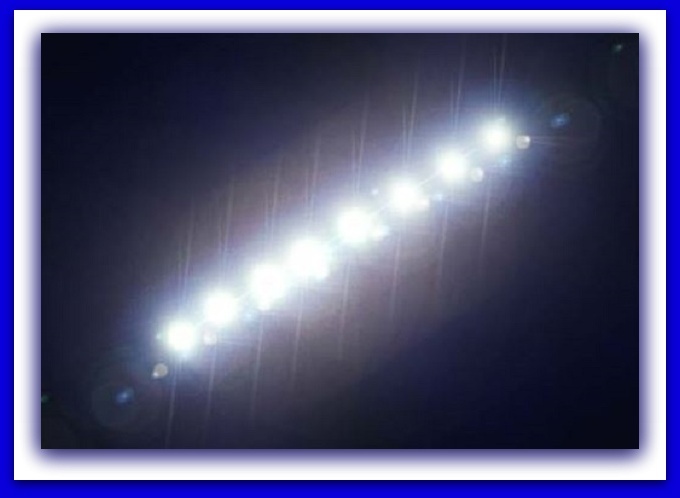 The lights were similar in color and brightness to stadium lights in a football field and appeared about that high up. There was no sound. We never saw a structure because the lights were too bright for our eyes to adjust maybe?? Now when thinking back it seems very strange that we didn’t see these lights as driving up the lane. We would have had a clear sight and at least would have seen the glowing. as we pulled in the field the lights were already there-they didn’t light up or appear after we were there. Then after the light went out I asked my brother, did you see that?” he said “yes”. I pulled beside the truck pretty shaken up. I didn’t see any marks in the dirt. I climbed up the trailer and looked at the bean piles with flashlight but didn’t see any footprints or any disruptions in the piles. They were rounded up nice and clean just as they should be. It was eerily still, or seemed that way at least. The semi started normally and no idea what this was. I watch alot of ufo programs these days and haven’t heard anybody describe similar sightings to mine but I know what I saw and have become a believer without a doubt. If it was our own secret government technology, what possible reason would they have to be checking out an outdated 1979 semi truck in a field loaded with soybeans? My primitive imagination suggests simply it was genuine curiosity. maybe they’ve never seen an old 2 cycle v8 diesel engine free of any electronic control and were trying to understand how it works. Lol who knows. I kept this to myself because if I tried to tell this story to anyone they would immediately suspect I was smoking crack. Crazy how successful this subject has been covered up and possibly the being themselves are able to manipulate humans or maybe they are already controlling everything. Anyways I feel better sharing and maybe this will help another case somewhere. NOTE: The above image is a rendering. I am an air traffic controller for Minneapolis Center. This evening at 1900 ((local/Central)) the pilot of an air carrier (heavy) that was under my control reported two flights of two aircraft. There were no other aircraft in the vicinity at the time. He said they were 15 miles in front of him at 35,000 feet traveling away from him in a westerly direction. 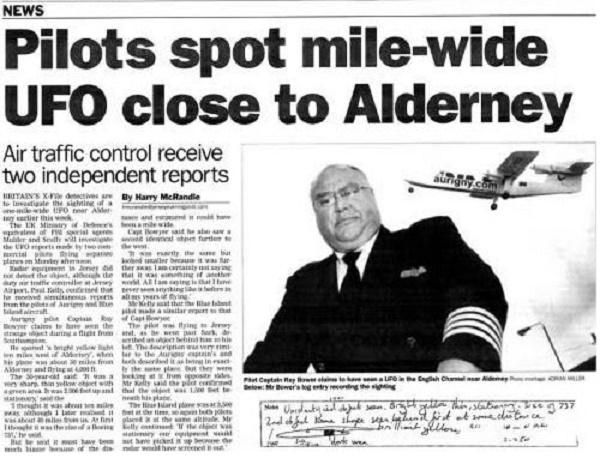 The UFO’s stayed out in front of his aircraft for approximately 15 minutes until the pilot said that the UFO’s were so far out in front of him that he could hardly see them anymore. After being relieved of my duties I reported it to my supervisor who put me in contact of the Military Air Defense. 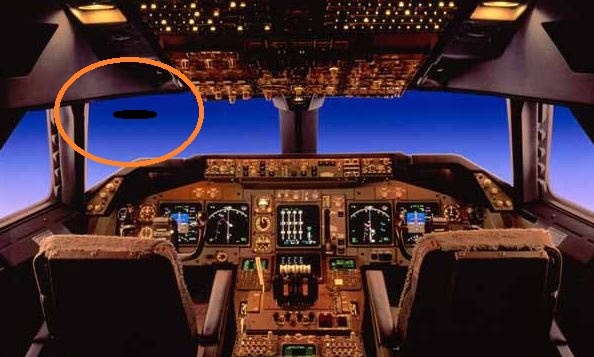 The person at the other end of the phone said that they saw no objects in the area of this aircraft. ((NUFORC Note: We have communicated multiple times with this witness, and FAA Air Traffic Controller, as well as with the Supervisor, mentioned above. They both confirm that no radar returns were visible on the Controller’s radar screen at the time of the incident. 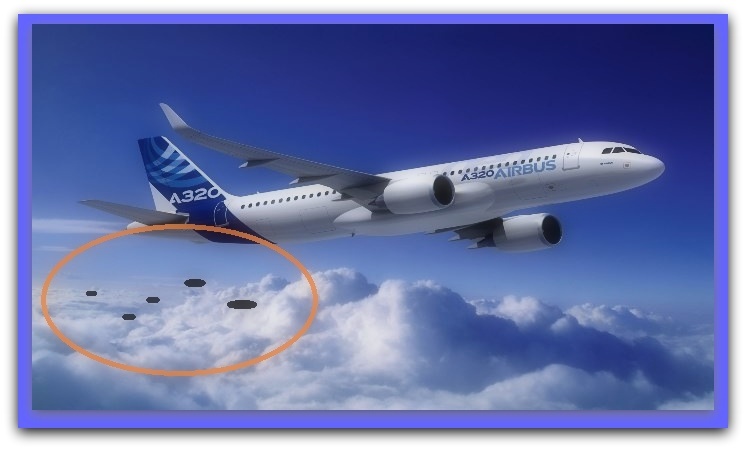 The case has been forwarded to the National Aviation Reporting Center on Anomalous Phenomenon (<www.narcap.org), Executive Director, Mr. Ted Roe, and Chief Scientist, Dr. Richard Haines, Ph.D., former Senior Research Scientist at NASA’s Ames Research Center in San Jose, CA. The case is under active investigation, and audio and radar data will be requested from the FAA with a Freedom of Information Act request. We express our sincere gratitude to the personnel in the FAA who saw to it that the information was forwarded to our Center!! SPECIAL NOTE: NUFORC would very much like to speak with the crew members of the aircraft, and most of all, we would very much like to have them submit independent reports, using our Online Report Form, describing what they saw and what happened during their reported sighting. We guarantee that the anonymity of the witnesses will be protected. Thank you! PD)) NOTE: The above image is a rendering. We live slightly up in the hills of Ashland about 10 minutes out of town, surrounded by trees. Both of my sons (ages 9 and 7) were outside camping in a tent they had setup on our deck facing East toward Grizzly Peak. This was the third night they had slept out there alone in a row. Around 11:30pm they came running into the house, petrified. I was dozing off lightly on the couch on the north side of the house. Same level. My older son leads the way, his face is white and jaw is dropped. He’s stuttering for words telling me that a big disc flew down over their tent and around our house. I asked them to elaborate, and they both started telling me the story in tandem and in agreement, practically word for word: My older son was playing on a device when he saw a very bright pulsating light through the top of the tent near a small opening. He saw it, but didn’t care. He said moments later the light became so bright that he had to investigate. When he got out of the tent and looked up he said directly over their tent was a very bright light pulsation from a craft. The light was alone and pulsating from an eye shaped hole. He stared at it confused and thought for a split moment that it was a helicopter or an air plane. 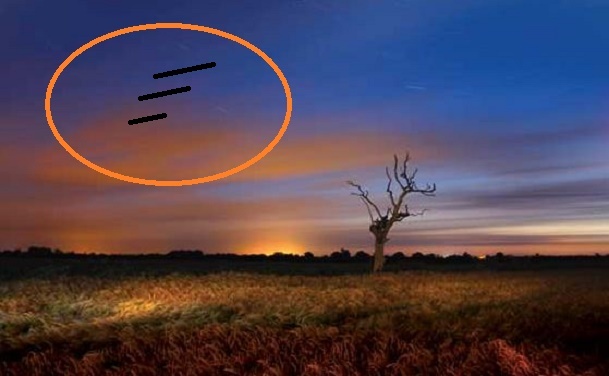 He said it then started showing different lights all around its body, and he saw that it was a disc shape, and that it was much closer than he thought, just near the tree line. He screamed for his brother to come see and shouted that it was a UFO. My younger son now begins telling the story: He said to my older son ‘yea right — your lying shut up’, my older son insisted and stuck his head in the tent and yelled at him to come up. The younger boy comes out of the tent and said that he saw the large disc shape object moving slowly now over their heads and down to the house, blinking multitudes of lights. Both boys are simultaneously speaking and using hang gestures to show me how the lights were moving around the spherical center of this disc. “So many” lights trailing everywhere. Multiple colors, blue red and yellow. Then, perfectly timed they both say “then boom! One huge light came from the center! Shining all over us!.” So bright it lit up the trees. They described the object as having a round dome on the top and bottom that the lights ran down. The the dome being bigger on top, with a bright light going around it horizontally. I was stunned at their reactions! This is extremely odd, especially for my older son who does not believe in anything other-worldly, and my younger son who seldom tells a lie. And never tells a lie without obviously displaying it with his body language. I asked them what the object looked like. They said it was “amazing”, “beautiful”, “like something they had never seen before ever”. My son described it as metallic and struggled to find words through his emotion. I ask him how big it was, and they both agreed it was at least the size of a bus, if not 2 buses. I asked them if they thought maybe it was a drone or quadcopter? My older son said it could have been but that it was huge. I suggested that if it were a drone and were large that it would be very loud. He immediately realized and told me that this object was completely silent but may have had a faint humming sound which came from it (my younger son did not comment on this, and only agreed! that it was extremely quiet). I began recording them immediately on my phone without them knowing so that I could replay it later. As they are telling me, my younger son sprinted back through the hallway to my baby daughter’s room (3 years old). Also on the north side of the house. When I yelled for him not to wake her up, he came back out and said he wanted to make sure she was still there in her bed because it had flown that way. Which I found heartwarming. I continued to ask them what it did and why was it here they thought? My older son said he didn’t know, but that it was “pacifically, pacifically at our house and interested in us” (‘specifically’ he meant). They described again how this object became very active and moved down more into their field of view as if for them to watch. There is a clearing on the south side of the house that has no trees. Where they described seeing this object was not at all hindered by trees. It would have been completely clear of obstructions with the nights sky behind it. Using a lot of hand gestures they told me the disc started circling downward slowly on the south side of our house into the trees (the deck is on the east/south corner of the house). I asked them how low it was they thought and they adamantly said they could have thrown a rock at it and that it was very low. They then said in the same corkscrew fashion it went back up and directly over the top of our house, still displaying the multitudes of lights and colors. They said it went across our house slowly and headed towards our neighbors house (northward toward the side of the house I was sleeping on). They said it then rose above the tree line and started flying away. They knew I was on that side of the house and ran in to come tell me. At my feet there are very large windows and my younger son insisted that I must have saw it. When I said I hadn’t seen it they were shocked and disappointed. I asked them how long the ordeal took and my older son said at least 3 minutes. I asked them again if they thought it may have been a plane or some other sort of craft, and they both said it looked like something they had never seen ever, and my younger son insisted that he thought they were aliens and that he was very worried. My older son agreed and said he could not imagine it being from this planet, but that he was not scared just shaken. He told me how shocked he was that he would ever get the ! chance to see something like this in his life. Something that ! would ma ke him change his mind about UFOs and aliens existing. I told them that I believed them, and that I believe it to be likely that there are other beings in and around this planet and that perhaps these beings seized an opportunity to touch the minds of 2 young boys. They were very relieved that I believed them and insisted I message and tell their mom. They also asked to sleep with me because they were too scared to go into their rooms. This is also very odd behavior for them. As was it for them to both agree on every aspect, and be so worked up. NOTE: The above image is a rendening. Description: It was around 1am and I had a few friends over. We were sleeping outside when one friend woke us up because of a fairly large upside-down pyramid was going past the tops of our trees before stopping. Since we live on a large space of private property we decided to hop on the quad bikes and follow it when we spotted another one. So as we followed the slow moving objects we were startled when a friend got to scared, so on the way back to the main house we look back to find that they had to begin to follow us now, and as the large moving objects got closer one by one our bikes stopped. So frightened we ran home to see the objects stop in our yard ( they were up fairly high but still hovering over the back yard). I got one of my family members outside to see what it was where we watch the two objects hover back before going up higher and then in one silent movement it disappeared just like that. The two people who were game enough to sleep outside till the next morning didn’t remember anything, yet me and the family member plus the other friend all remember what happened very well. NOTE: The above image is a rendering. Two or three nights prior to the incident, my friend (I’ll call her “A”) and I drove to pick up her niece from her boyfriend’s house. I drove my car. We picked up the niece and on the way home, “A” suggested we take another back road that was a shorter route. This particular route was done a lonely country road through a very rural farming community. We approached a railroad crossing and just before I drove over the tracks, I saw the silhouette of an airplane flying directly above the treetops in front of us. I stopped at the stop sign to watch what I assumed was a military issued plane flying at an alarmingly low altitude (barely above the treetops). The strangest thing was, the plane’s engines weren’t running–there was no sound. I turned off the car engine and poked my head out the window to better be able to hear and I was really confused as to how this military plane could possibly be flying so low without any engines running and not crash? We all watched the plane as it flew over a patch of pine woods, until we could no longer see it. We all thought it was strange, but nonetheless, we didn’t dwell on it and we went on with the ride home without thinking any more of it. **It should be noted parenthetically that we didn’t actually see any identifiable markings on the plane that would authenticate it as being a U.S. military aircraft. I make that assumption based on the shape of the plane being consistent with other U.S. military aircraft and its dark color. TWO OR THREE DAYS LATER: My friend “A” and I are, again, in my car. We were heading out of town to look for jobs. We decided to take a back road through the woods and farmsteads, since it would connect us quicker to the highway than the normally traveled route (not the same road from a few nights earlier, but around the same area). We’d used this road before with no incident. It was a perfectly clear day, around 1:00pm or 1:30pm and the weather was warm and bright. We were both very eager to apply for jobs that day. The road we traveled was a dirt road (red clay) that cut through some very isolated terrain. To our left was a single farm house and an expansive corn field and to our right was a pine forest. We had only been driving this part of the road for about four minutes (we’d JUST passed the farm house) when I saw what looked like the same military plane flying out from over the pine woods to our right. It was AGAIN flying just a few hundred feet above the tree tops with NO SOUND. This time, I immediately stopped the car, shut off the engine and we both exited the car and stood in the middle of the road, in the middle of the day, to see just what the hell was going on. Again, we were so perplexed as to how this plane could just glide smoothly without any engines running and manage to stay at the same altitude?? The plane glided (like a hang glider) over the outer edge of the pine woods, along the edge of the road, headed in our direction. As we stood and watched, I barely noticed a flash of white somewhere over the pine wood, just on the other side of the plane. I didn’t give it any attention because I was so transfixed on this plane with strange flying habits. “A” suddenly asked, “What is THAT thing?”, to which I dismissively replied, “It’s probably a bird” (there were large white crane-like birds in the area). My friend shouts, “That’s not a *** bird!” I take my eyes off the plane to take a look at the white object (I was a little irritated that she was distracting me, while I’m trying to figure out what this plane is doing). Just as the plane veers back over the pine wood, this “thing” flies from over the tree tops, directly BENEATH the plane and out into the clear, right above us. The plane has now disappeared over the tree tops and out of sight and we never saw it, again. It was (this is the best I can describe it) a white object that was shaped like a dumbbell or a peanut that was turned on its side, horizontally. It moved at a slow, but steady pace and in a straight line, from right to left. Since it flew just below the plane, I could tell easily, that it was about the size of a standard yellow school bus (approximately 30-35 feet long). It had no markings, no windows, no seams, no rivets, no hatches, no engines or exhaust–nothing–just a solid object, colored white, that was low enough that its appearance could be easily determined. As we watched (neither of us spoke for the next ten minutes), the object changed from a solid white to silver (like mercury) and reflections of the pine trees and corn field could be seen on its surface!!! After a few moments, the object (still moving steadily, but painfully slow) “changed color” again, this time, however, it turned “opalescent” and seemed to shimmer in hues of pastel pink, blue and white. That’s when it became completely transparent, like glass, and only a faint outline could be seen. It bears repeating that this was a perfectly clear day with not even a single cloud in the sky–not one. The object “shimmered” back into view and was again, opalescent and then, silver colored, then white, again. This pattern repeated itself for the duration of the sighting. The object has now made its way across the dirt road and over the vast corn field. All of a sudden, from the left of the sky, there was a white “cloud” (I use the term loosely, because while it had the same color and texture as a white cloud, it was smooth and almost perfectly spherical, like a cotton ball. The cloud seemed to literally appear out of nowhere. The object, still “changing color”, approached the “cloud” and entered it. 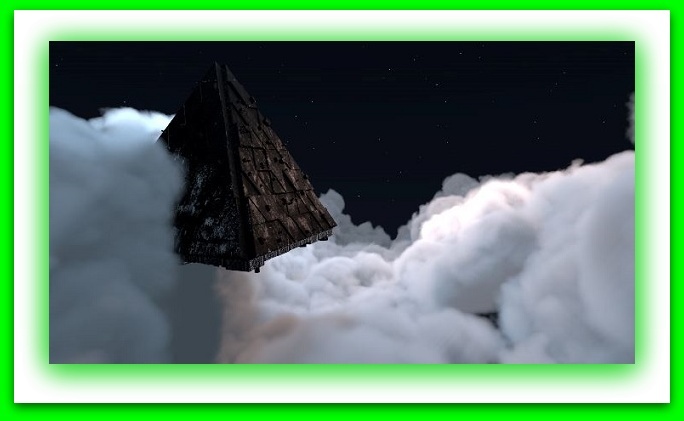 The cloud and the object were roughly the same size, the “cloud” being only slightly bigger as to barely accommodate the size of the object flying into it. The object never emerged from the “cloud” and within a few seconds, the “cloud” itself just faded out of existence, as though it was never there. The sky was once again empty, clear and blue. I snapped out of the slack-jawed trance I seemed to be in and immediately knelt down and drew the peanut shaped object I witnessed, in the dirt, with my finger. My friend, now crying, said, “That’s what I saw, too”. From the time we saw the plane and stopped the car, until the time the object and the “cloud” disappeared was approximately ten minutes. We were both effectively scared and confused by what we saw AND at the idea that whoever was flying the military plane HAD to have seen that we were watching this phenomena unfold and they might come back for us, having seen something we weren’t supposed to. We got back in the car and I drove her back home. I, too, went back home and didn’t leave my house again for almost a week. During this time, I told my aunt about the incident, just in case I suddenly went missing. Please understand, that I’m not a conspiracy theorist, nor am I a paranoid person. 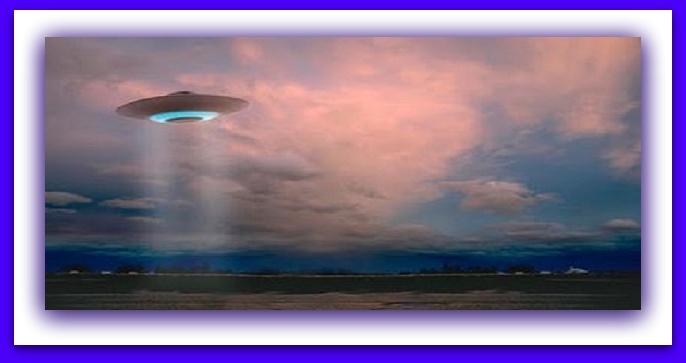 In fact, I would normally condescend those that claim to have encounters with UFOs or the “men in black”. After this, however, I have respect for those people. I won’t claim that what I saw was extraterrestrial because I don’t have enough information to come to that conclusion. It could’ve been some secret military weapon or experimental aircraft, for all I know. I DO know that whatever we saw, it was NOT normal and I’m pretty sure it was none of our business. I was thirty years old that summer and my friend was twenty-five. I no longer live in South Carolina, but I am still connected to this young lady via Facebook and about once a year, I send her a message asking her to remind me that I’m not insane and that we really saw what we saw. She always replies that, yes, we did see it and that no one believes her when she tells the story. Unfortunately, we did not have a camera to take pictures or video. This occurred in 2008, before the advent of the smart phone. I can’t prove to anyone else that what we saw was real, but I know it happened and so does the young lady, “A”. The events transpired as described, without any embellishments or assumptions. What you’ve read is how it happened. I’m willing to take a polygraph. NOTE: The above image is a rendering. Arcesio Bermudez was a 54-year-old Colombian who apparently succumbed to the powers of the mysterious UFOs, creatures whose existence is unknown, but who are nonetheless real, according to experts. 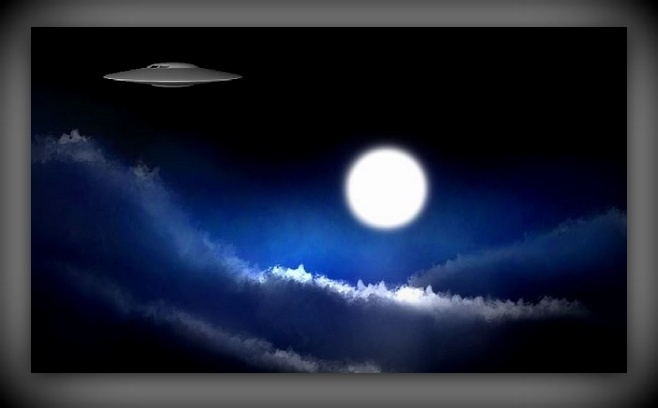 Ufologist William Chavez claims that the event took place on the evening of July 4, 1969 in the town of Anolaima, municipality of Cundinamarca, when Arcesio’s family climbed a hill to do some star gazing, and managed to see a small light that increased its size substantially. “Mister Arcesio went out to see what was going on. He stared at it and decided to point his flashlight at the unknown entity at that moment,” says the specialist. Chavez claims that the peasant received a magnetic blast, causing him to feel sick hours later, developing signs of hypothermia shortly after. He was sent to a clinic in Bogotá. After being hospitalized for several days, experiencing intense fever, the Colombian died under circumstances that medical experts could not explain. More details emerged about Mr. Bermudez’s sudden illness after his alleged CE-3. Feeling ill within hours of the event, his malady extended for three days until a relative came to collect him and take him to Bogotá for treatment by car. According to his family, Bermúdez was cold to the touch, and that he leaned against his sister’s side in the vehicle. Creepier still is the detail that the side of the sister’s body “remained cold until the day she died.” Bermudez’s preternatural chill was such that the nurses at the Bogotá health center were unable to draw blood samples, as his vital fluid had “crystallized”.” The national police and the army conducted an investigation into the death of the man who seemingly came into contact with an unidentified flying object. However, the authorities were never able to clarify the events. This small piece of information by Colombia’s Radio Blu does not mention the fact that the case received considerable attention at the time, and not just within Colombian borders. An issue of the TIEMPO newspaper dated 18 July 1969 shows members of the APRO research organization, under the direction of Jim and Coral Lorenzen, along with local authorities and eyewitnesses. The text reads: “They do exist because I saw them,” replied Marina Isabel Franco, a young witness to the phenomenon. Scientific evidence corroborates that the strange object was indeed seen by many people. There is interest in this exclusive by EL TIEMPO.” NOTE: The above image is a rendering. Welsh police confirmed that one of their helicopter crews had spotted an “unusual aircraft” flying over Cardiff earlier this month. An investigation into the sighting had been launched, they said. The police clarification came after tabloid newspaper The Sun reported a UFO had “attacked” a police helicopter, following it for several miles over the Bristol Channel. “The pilot banked sharply to avoid being hit, then launched into a high-speed pursuit. But he was forced to give up the chase as the helicopter’s fuel ran low — and the UFO escaped,” the tabloid reported. 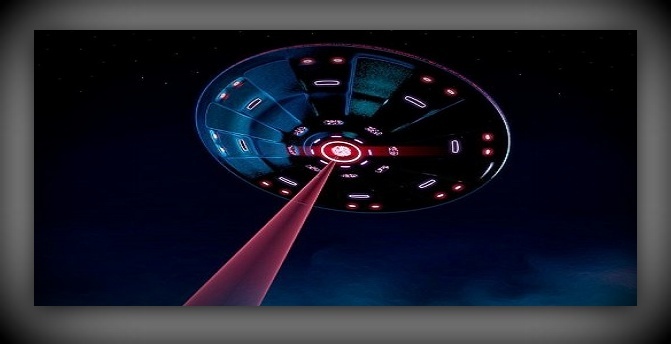 The helicopter crew had described the object as “flying saucer-shaped and circled by flashing lights,” it added. That description was rather more dramatic than the official police version, which said: “South Wales Police can confirm its air support unit sighted an unusual aircraft. “This was reported to the relevant authorities for their investigation,” they added in a brief statement, avoiding the use of the term “UFO”, or Unidentified Flying Object. At the time of the incident, the helicopter with three men on board was waiting to land at the St Athan RAF base near Cardiff. The sighting reportedly took place at 00:40 am (23:40 GMT) on June 8. South Wales Police denied there was a pursuit and indicated that the helicopter crew was never in any danger. A Ministry of Defence spokesman said it had heard nothing about the incident. 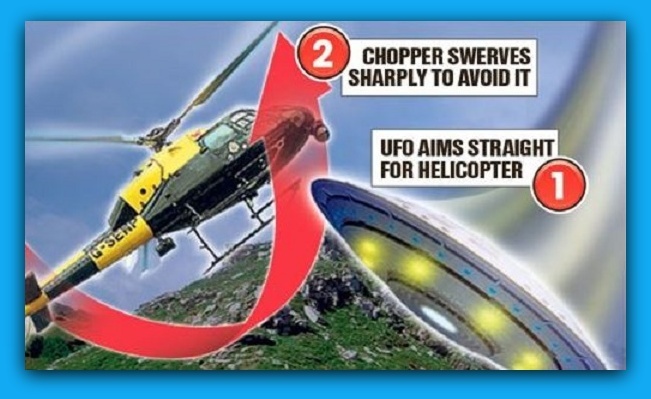 “But it is certainly not advisable for police helicopters to go chasing what they think are UFOs,” he added. On the night of March 14, 1965, James W. Flynn, who is a rancher and hunting dog trainer, was camped out for the night in the Florida Everglades. Just as he was settling down for the night, his dogs became restive and upset. He looked around expecting visitors, but instead he sighted a bright light silently and slowly descending about a mile away. Thinking that perhaps an airplane had gotten into trouble and gone down, he prepared his swamp buggy for the journey and set out to render aid if needed. He was guided directly to the spot by the glow which continued unabated. This worried Flynn as he expected to find a burning plane and probably injuries or fatalities. He found neither. Pulsating Glow. When about a quarter mile away, he grounded his swamp buggy and continued on foot. Soon he found himself in a large clearing and he wasn’t alone. Some twenty yards away he saw a circular, cone-shaped object with a pulsating glow. It hovered just above the ground with a slightly perceptible wobbling motion. He detected, after a bit of study, a sound he could only describe as a hum. He estimated the size at well over seventy-five feet in diameter and twenty-five to thirty feet thick. There were four rows of ports or windows encircling the craft, each emitting a yellow light unlike the color of the craft’s overall glow. A partition immediately behind the windows prevented him from seeing any internal details or occupants. For many minutes Flynn just stood there, amazed. He had heard of such things, but, until now, had never really taken them seriously. Overactive imagination, he’d thought. But this was not imagination. It was real. Curiosity overcame fear. He started to approach the craft to get a better look. He never made it. A pencil thin blue light shot out from “somewhere” on the craft hitting Flynn on the forehead “right between the eyes.” He was unconscious before he hit the ground. When he regained consciousness, he was partially blind, sluggish, had a terrific headache and a large, sore bruise on his forehead. The craft was gone. Somehow he got his swamp buggy going and got to his hometown of Ft. Meyers, Florida. He was rushed to a hospital for examination and treatment. After he told his story, investigators went back to the spot. They found a large circular spot in the clearing where the ground and grass were charred. The tops of some nearby trees were severely burned. The trunks and limbs of some of the trees were scarred. The Air Force, at that time, normally debunked and belittled UFO sightings and the people who reported them out of hand, but in this instance, they did not reckon with Flynn’s standing in his community. On this occasion the Air Force had to partially back off. They only took one shot, that I can find, in that they labeled it by innuendo to be a hoax. Question is, how did Flynn fake the charred circle of ground, how did he burn and scar the trees and, most importantly, how did he self-inflict a bruise of such shape and intensity? One final piece of evidence helped exonerate James Flynn. One of his physical injuries was atrophy of internal muscles. Medical science tells us that one can’t be faked; period! It happened, probably exactly as Flynn described it. The trouble is he doesn’t know what it was nor where it came from. So, even today, it’s still carried in the annals of the UFO as unexplained! NOTE: The above image is a rendering. I was 12 at the time. We left Glidden around 2 or 3 am going out to Lake Augustin. We seen a fireball about 50 yards in front of us and it came towards us at a high rate of speed. We were all scared but it went over the car, and then it was gone. The second time it was the next year . Again it was summer around the same time at night. We first seen the light in the trees as we got closer to it. It got so bright it was hard to see. As we got closer to it a logging company made a path in the woods so the trees were gone and at that time we could see the UFO and the bright light on the bottom of the UFO. Every one in the car started screaming. I was sitting behind the driver telling her to turn the lights off and stop. At this time the people in the car started yelling at the driver to go. What I seen that night was a UFO. At the back of a house with a very bright white light on the bottom the light was about 15 feet wide and the UFO was about 30 feet wide and it looked like a gray metal. I didn’t see anyone or anything. At some point the light dimmed and the UFO flew towards Glidden and the people in the car finally stop yelling. I was asking the driver why she didn’t stop and she told me it was dark out and she didn’t want to get her car hit by another car. It was so bright at the time, it was as bright as day. Another lady in the car said you will see things like that at night. Nobody wanted to talk about what happened. The next day one of the adults told me never talk about what happened to anyone. Well a few years later in the summer we were up at the lake and I was talking to someone that had a cottage on the other end of the lake and she asked me what was going on over by me the night before. I asked her what was she was talking about. She told me someone at her place went outside late at night and he seen a very bright light in the area I was staying at. All I remember from the night before is I went to sleep around 10 pm so I could go fishing the next morning. As the years went by I was in my late twenties and I talked to my sister about what we seen she didn’t have any memory of it. She told me she wished she did. I’m 55 now the 2 adults in the car have died and 2 of the kids I lost contact with, and my sister doesn’t remember anything. NOTE: The above image is a rendering. Weather Conditions: Full Moon on Eastern Sky, Extremely calm no breeze at all. Mild temp. Very bright night. Description: I was sitting at front doorstep when I heard one of my ducks screaming as if it was being eaten alive. All other birds started making funny noises. I have a lot of Guinea Fowl and they were chattering loudly as if there was a fox present. My 4 dogs ran outside and started barking, one of them standing on the front lawn looking up into the air. Then all of a sudden I heard a “wooshing” noise and a high pitched scraping/screaming/grinding noise accompanied by 3 large unidentified lines in the air. I have never heard a noise like it, it was almost blood curdling. The only way I can describe the objects is as if there were 3 black telephone poles flying horizontally through the air. The objects flew very slowly over my roof (10k/h) about 30ft from the ground heading north in an upwards direction and then disappeared. I did not here a lead up to the noise, like as if it was far away and getting closer. It was as if the objects were behind the house somewhere and then just took off. A cow in the next paddock then started making a strange sound. Then I heard one of my ducks way over in a distant paddock. NOTE The above image is a rendering.